Dr. John Treacy, Clare County Council, Pat Dowling, Chief Executive of Clare County Council, and Councillor Michael Begley, Mayor of Clare, pictured with piper Blackie O’Connell during a ceremony marking the 120th anniversary of the first meeting of Clare County Council, which took place in the Grand Jury Rooms of Ennis Courthouse on 22 April 1899. At its April monthly meeting on Monday (April 8) Clare County Council marked the 120th anniversary of the first ever meeting of the local authority, which took place in the Grand Jury Rooms of Ennis Courthouse on April 22, 1899. The ceremony featured presentations by Pat Dowling (Chief Executive) and Dr John Treacy of Clare County Council on the history of Clare County Council and the origins of the local authority. Mr Treacy is writing a book on the history of local government in Clare which is due for publication in May 2020. The ceremony also featured musical entertainment by piper Blackie O’Connell in memory of the famed Clare piper, Garret Barry. 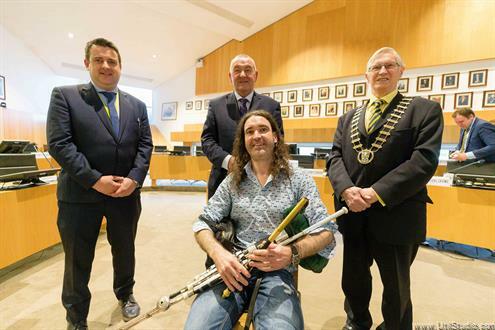 The piper died on the same week that the first elections to Clare County Council were held in April 1899. To mark the 120th anniversary of the first meeting of Clare County Council, the original minutes of the first meeting as well as an original copy of the Local Government Act 1898 have been placed on public display in the foyer of Áras Contae an Chláir in Ennis.